Hanoi (VNA) – Turkish Prime Minister Binali Yildirim, who is in an official visit to Vietnam from August 22-24 at the invitation of PM Nguyen Xuan Phuc, has granted the Vietnam News Agency an interview. Binali Yildirim emphasized that he is the first Turkish Prime Minister to visit Vietnam since the two countries established their diplomatic ties in 1978. He noted the visit “is late but is a good start” for more high-level visits between the sides in the coming time, which would contribute to the improvement of Vietnam – Turkey relations. The PM said Vietnam and his countries “have comparative advantages to do fruitful things together”. According to him, Turkey is located between Europe and Asia, while Vietnam is a member of the ASEAN. Both nations have relative large populations and rapid economic growth. The target to increase bilateral trade to 4 billion USD by 2020, which is now less than 2 billion USD, is achievable, he stressed, adding his delight at strong investment between the sides across many fields. The official said daily flights from Istanbul to Hanoi and Ho Chi Minh City have facilitated traveling between Vietnam and Turkey and recommended that easing the visa regime could help the activities thrive. 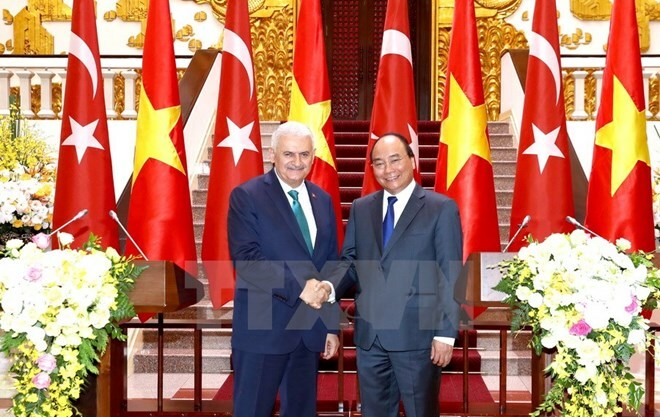 Concerning measures Turkey would take to enhance trade with Vietnam, Binali Yildirim said his country is ready to start negotiating a free trade agreement and has already decided upon double taxation avoidance and trade facilitation with Vietnam. The PM said investors from Turkey are eyeing the Vietnamese sectors of infrastructure, tourism, renewable energy, tourism, textiles, mining, and ship-building. Many Turkish businesses operating in Vietnam said they are happy with the investment climate and appreciate assistance from the local Government, he added. Talking about the importance of Vietnam in Turkey’s foreign diplomacy, he said the countries are working together in various bilateral and international areas. He stated Turkey supports Vietnam’s bid for a non-permanent seat in the UN Security Council in 2020-2021, and asked Vietnam to back his country’s effort to become a member of UNESCO'S executive board for 2017 – 2021. He also pointed to education as an important cooperative sphere, saying Turkey is willing to offer scholarships for Vietnamese students and take part in student exchange programmes. The PM said during his trip so far, he has been impressed with the sincerity and hospitality of Vietnamese people and strong will of Vietnamese leaders in boosting bilateral ties. He noted Vietnam and Turkey will jointly celebrate their 40 founding anniversary of diplomatic relations next year.